TerraBlock™ Crawl Space Floor Insulation is a durable, long-lasting insulation product designed specifically for crawl space floors. Able to be installed on uneven floors, this product includes a white vapor barrier that will keep moisture from making its way up through dirt, stone, or concrete crawl space floors. If you have water seepage in your crawl space, TerraBlock™ can be combined with drainage matting and perimeter drainage pipes to direct water to a sump pump system. This system is durable enough for regular traffic from homeowners and service workers, without risk of damaging the vapor barrier or crushing the insulation. For added durability, an additional crawl space liner may be installed on top. For a free crawl space insulation quote, contact us today! 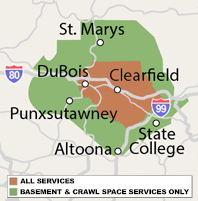 We serve Du Bois, State College, Altoona, Saint Marys, Bellefonte, and many nearby areas in Pennsylvania. A vented crawl space will cost you a bundle in utility bills, while rot and mold will force you to make otherwise unnecessary repairs to your home. Sealing and insulating the crawl space using this puncture-resistant, padded product will help to keep your utilities (such as your furnace, heating ducts, hot water pipes, and water heater) from having to work in a cold, damp crawl space. It will also protect the wood and stored objects in your crawl space from water vapor and humidity, controlling mold. TerraBlock™ is just one part of our complete crawl space repair system. By combining it with our other products, including our SilverGlo™ Wall Insulation and CleanSpace® Vapor Barrier, you can keep your crawlspace dry and insulated. We can also waterproof your crawl space with products like our SmartSump™ Sump Pump, our SmartPipe™ Drainage System, and our durable CleanSpace® Drainage Matting--all of which are compatible with a TerraBlock™ installation. At Bowman Masonry & Waterproofing our team of in-house crawl space experts has just what you need to encapsulate your crawl space and keep it a warm, dry, and clean-looking place--one you won't mind crawling into! For a free written crawl space insulation quote at no obligation, call or e-mail us today! We proudly serve Tyrone, Port Matilda, Kersey, Brockway, Ridgway, Pennsylvania Furnace, and many other parts of Pennsylvania.